"As it stands, economic growth is largely dependent on resource consumption. As a country grows, so does its use of natural -- and limited -- high-quality resources like oil, gold, and copper. But this is untenable in the long run, especially as growing countries like India and China model themselves increasingly on American habits of consumption (a car, two cell phones, and 30 pounds of meat for all!) The seemingly impossible solution: separating resource use and environmental impact from economic growth -- a process with the unfortunate moniker "decoupling." According to a new report [Decoupling Natural Resource Use and Environmental Impacts from Economic Growth] from the United Nations Environment Programme (UNEP), decoupling is already happening, albeit at a small scale. 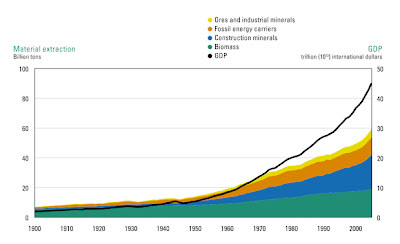 The resources required per $1,000 of economic output dropped from 2.1 to 1.6 tons between between 1980 and 2002"
Also check out my previous posts on The Sustainability of Economic Growth ~ Material vs Intangible Economics?, Energy Intensity, and Ever More Efficient GDP.